When asked how well they understand the recent financial problems involving Wall Street investment banks and other companies with ties to the housing market, a majority of Hispanics (57%) say they don’t understand the situation too well or at all. Even so, many respondents are willing to identify the factors they feel were responsible for the bleak state of the economy. The survey asked: “How much do you think each of the following has contributed to the current problems in financial institutions and markets?” It then queried specifically about the lending policies of banks and financial institutions; people taking on more debt than they can afford; and too little government regulation of financial institutions. Individuals taking on too much debt receive the brunt of the blame—76% of respondents feel that they contributed a lot or some to the present situation. 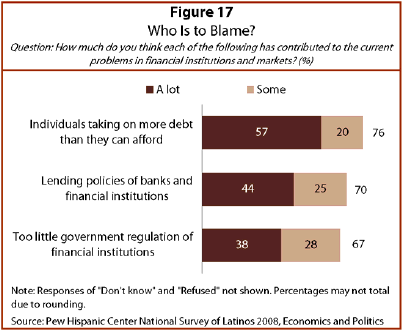 However, large proportions of respondents also blame banks and financial institutions (70%), and too little government regulation (67%). In October of 2008, the Pew Research Center for the People & the Press posed a similar, though not identical, set of questions to the general population. The largest proportion of respondents (94%) blamed people for taking on too much debt; a lesser proportion blamed banks for making risky loans (89%) and a slightly smaller proportion (80%) blamed weak government regulation of financial institutions.